Superman Unbo und was flat out in my opinion the best DC animated movie to date. The animation was superb throughout most of it, the story was solid, and the voice acting and action were outstanding. I’ll break it down for you in some detail, but be warned there are SPOILERS ahead. We begin with the credits rolling and perfect orchestral music to go with it. During the credits it shows the origin of Brainiac. This is the real Brainiac in my mind. Many incarnations show him as a supercomputer from Krypton, but growing up I always knew him as an alien who became computer. He is by far one of my favorite villains of all time, and because of who he is and how he thinks. I never knew of an origin for him, so this was nice to see although quick. As fast as it was shown, it was effective, from ripping out his real eyeballs to drilling holes in his head. Then our story begins. While Superman is in Belize helping fix earthquake damage, Supergirl is filling in in Metropolis. Using Lois as a catalyst, the writers decided to explain to the audience that Kara is as super as her cousin, but a teenager and filled with teenage emotions. Without being too spoilery and going into unnecessary details, we’ll skip ahead a bit. When Brainiac’s first drone arrives at earth, Supergirl knows all too well what it is. She explains to Superman who Brainiac is and how he shrunk the entire city of Kandor on Krypton. The animation showing this was pleasing to the eye, but I feel at parts (and during this whole movie) that it shifted slightly. It seemed in areas (and only briefly) that a few series of frames were rushed with shading. It was almost a different style in areas that threw me for a loop, but didn’t impact the movie negatively. It was just a little confusing as to why they did that. Superman goes to find Brainiac in space and he helps a planet defend against the alien machine. Here you get to see how helpless even Superman is against him, as the man of steel eventually gets captured and placed inside the Kryptonian shrunken city on Brainiac’s skull ship. BTW, the skull ship animation and design was nearly identical to the one in the comics from the 80s. Eventually escaping and returning to earth where the battle has moved, Superman and Supergirl fight off the invasion to prevent the shrinking of Metropolis. They fail! I never expected to see metropolis shrink, but it was done here, and though it was restored in the end, it was refreshing to see how dangerous Brainiac really is. In the end, Kara races to stop a rocket from making our Sun go Supernova, and Superman faces off against Brainiac on Earth. The way Superman defeats Brainiac was by far the BEST battle I have seen in a long time, and it isn’t as action packed as you might think. I just don’t want to spoil it that much. Trust me, it is awesome! My only shocker in this movie was Lois Lane flipping the bird with both middle fingers to the alien machine. While I tried to distract my kids from that scene, I was giddy inside with delight. Damn right, she’d be saying F*$& off in that situation. There was also an underlying theme to go with this story. Lois and Clark have been dating for a long time, but still keep it a secret. Their relationship is being tested because he refuses to go public with it. This causes dispute between them, but in the end all is right. So is there room for more? Absolutely, and I’m really hoping to see a continuation of this story. Kandor was restored on a new planet that I can only assume would be called “New Krypton” like in the comics, Clark asks Lois to marry him, and Brainiac, although his body is destroyed still has active components. I’d love to see the machine version of Brainiac from the 80s Superpowers cartoon appear as a villain. 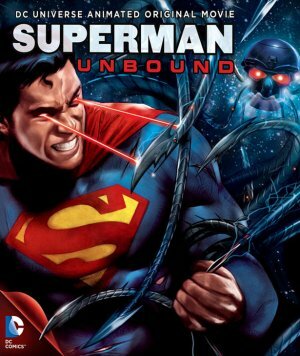 All in all I’ll rate Superman Unbound at a 8 out of 10.